October was an odd month. It was as if somebody dipped me in estrogen while I was sleeping. I became terribly, alarmingly family-minded and domestic. I went with my daughter on a Girl Scout camping trip (yeah yeah so I only lasted one night. It was the effort that’s important here, yes?). I took the kids to visit my cousin and her family in leafy New Hampshire. I made their Halloween costumes. Actually sewed them, under the ever-patient, only slightly mocking eye of Audge. A Jawa robe and hood may look simple, my friends; it is anything but. By Oct. 29 my brain was on housewife overload, coked up on the promise of delighting my children further and blind to the time/space continuum constraints bestowed upon me by the need to make rent. 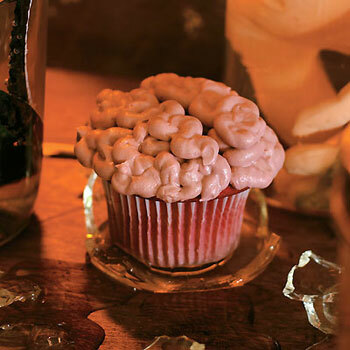 It was on that day I decided to make brain cupcakes for Halloween. I also had a pastry bag with the correct attendant nozzle. 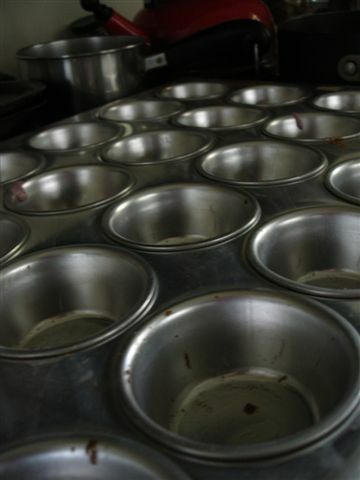 What I didn’t have was muffin tins. My neighbor’s mother did, however. A large, fancy, 24-cupcake model. And Tony had just gifted me with some cool turquoise spatulas from Sur La Table over the weekend. I was ready to bake, baby. For their assembly, I took some hints from one commentator who said she’d been baking red velvet cake professionally for years. I’ll note them where relevant. Preheat oven to 350. Cream butter and sugar until fluffy. (the commentator suggested using shortening instead of butter, for a more tender crumb. But I don’t even know where to buy shortening. I used butter.) Add eggs and blend well. Make a paste of cocoa and food coloring and add to the butter mixture (I had to add a little water to make this paste). Sift flour and salt together into this mix. One at a time, add the buttermilk, the vanilla, and the water. The commentator suggested mixing the baking soda with the dry and mix the vinegar with the wet or cream with the butter/sugar mixture. Use sour cream instead of buttermilk. I took all these suggestions. 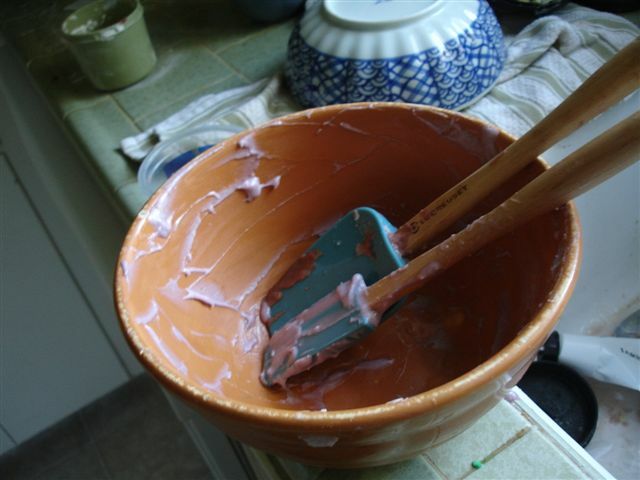 I could not exactly pour this batter into anything, it was that thick. But they spooned OK into the paper cups, and I smoothed them out with a teaspoon dipped in water. After just over 15 minutes of baking, my cupcakes were done. 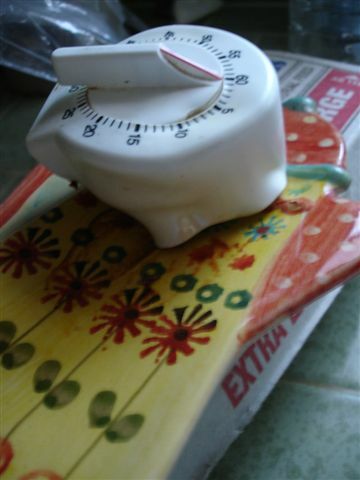 My timer, unfortunately, was also done. It baked, along with the cupcakes, on top of the stove, onto my spoon holder. Hey. If you want competence, you’re at the wrong house. Try the Cupcake Blog. In a large bowl, cream the butter until smooth. Add the sugar, salt, milk and vanilla and mix until smooth. In a separate small bowl, use red and blue food coloring to mix a dark purple. 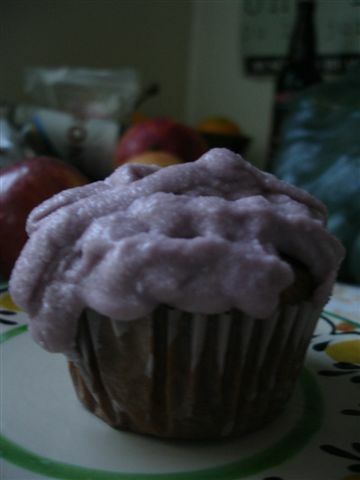 Use a few drops, or until your frosting is an alarming, fleshy tone of gray matter. I had refrigerated the frosting overnight in an attempt to thicken it. But, channeling Dr. Frankenstein, I had a brief moment of doubt as I scooped it into the pastry bag. Brains? How was I going to make frontal lobes out of frosting? Didn’t that take a level of artistry I didn’t have? I needn’t have worried about that part. Brains are surprisingly easy to create, given the right attachment. And I was thrilled with the nasty brain-like color I produced, quite on accident. The larger problem was with the melting. My lovely, worm-like hemispheres began to melt into each other even as I finished laying them down. Why? It was a cool afternoon, nor was my kitchen particularly hot. I put them into the refrigerator so they’d maintain their shape. The kids, I knew, would love these gruesome cakes, although my girl had already announced her plans to rebuke them without so much as a glance. I made her a straight cupcake, with sprinkles, just in case she changed her mind and took a little peek. I also made a tortilla, and got some crunchy bread. The kids would need to eat before trick or treating. And the grownups would probably like a bite as well. the magazine. On the right is how they’re supposed to look. And this is how mine turned out. Sigh. They tasted pretty good, though. I ate two for breakfast the next morning. The lesson: This is your brain. But not the brain I made. It’s November now and I’m back in my proper frame of mind. I’m just saying no to domesticity. I think it’s best for everyone involved, don’t you? Loved the cupcake story! have to admit, I’m with your girl, I couldn’t have eaten the brain icing either,maybe after it had melted a bit I could have given it a go.I’m in Oz and red velvet is not a familiar cake flavou over here, does anyone balk at all the red colouring? Do different people use different things to achieve the red, or is it always colouring? Great reading, I’ll link you so I can look in again again.